Step those eggs up a notch! 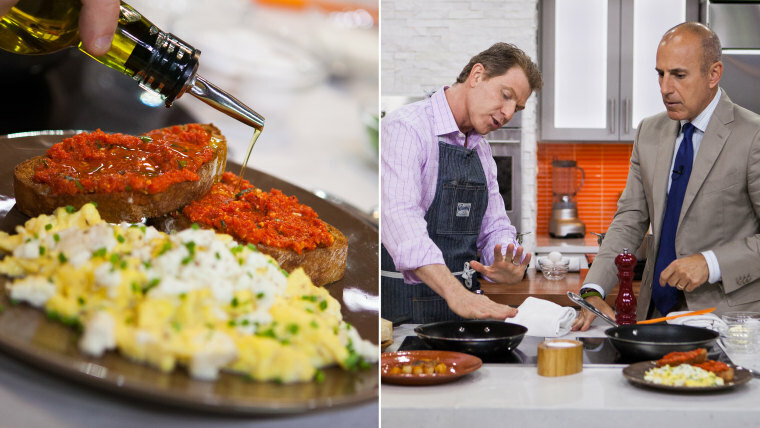 Bobby Flay shared three delicious breakfast recipes each featuring protein-packed eggs cooked in a variety of ways, from poached to fried. Drizzle the cut sides of the ciabatta with the olive oil and season with salt and pepper. Put on a baking sheet cut-side up and bake until lightly golden brown, about 15 minutes. Combine the piquillos, pine nuts, Parmigiano, garlic, pinch of red pepper flakes and some salt and pepper in a food processor and process until coarsely chopped. With the motor running, slowly add the olive oil through the feed tube until smooth. If the mixture is too thick, add a few more teaspoons of oil and pules. Transfer to a bowl. Heat the olive oil and butter in a large nonstick saute pan over medium heat. Pour the egg mixture into the pan, season with salt and pepper, add the crème fraiche and cook, stirring constantly until soft curds form. Right before you pull the pan off the heat, when the eggs are almost done but not quite, add the goat cheese, in dollops and gently fold in for a few seconds to melt. To serve, spread some piquillo pesto on the toast to serve alongside the scrambled eggs. Garnish both the eggs and the toast with finely chopped chives. Heat 1 tablespoon of the butter and 1 tablespoon of the oil in a medium saute pan over medium heat. Add the onion, stirring occasionally, until the onions are golden brown and caramelized, about 40 minutes. Season with salt and pepper. While the onions are caramelizing, put the potatoes in a medium pot of cold, salted water, bring to a boil and cook until nearly tender but a knife inserted into the center still meets a little resistance, 10 to 12 minutes. Drain well. Combine the onions and potatoes in a bowl and season with paprika, salt and pepper. Heat the remaining butter and oil on a cast iron griddle or in a large nonstick saute pan over medium heat. Add the potato mixture, packing it evenly with the back of a metal spatula for form a cake. Cook until the underside is golden brown and crispy, about 10 minutes. Invert a plate or baking sheet without sides over the pan and carefully invert potato cake onto it. Carefully slide potato cake back onto the skillet and cook until the bottom is just set and pale golden brown, about 2 minutes. Transfer to a cutting board, crispy side up and cut into wedges. Melt the butter in a large nonstick saute pan over medium-high heat until it begins to sizzle. Carefully crack the eggs into the pan, two at a time, season with salt and pepper and cook until the whites are firm and completely cooked but yolks are still soft, just set up, about 2 minutes. To serve, place a wedge of hash browns on plate, top with fried egg. Shave some Parmigiano Reggiano on top and sprinkle some smoked paprika. Garnish with drizzle of extra virgin olive oil and extra black pepper. Add vinegar, shallot, Dijon, honey, salt and pepper to blender. Mix to combine. With machine running, slowly add oil in a steady stream until emulsified. Set aside. Heat oil in a medium saute pan over medium heat, add the bacon and cook, stirring occasionally, until golden brown and crisp, about 8 minutes. Remove with a slotted spoon to a plate lined with paper towels. Place the frisee in a large bowl, add ½ the bacon lardons, ½ the toasted almonds, and 3 tablespoons of the dressing, salt and pepper. Lightly toss to coat. Heat the water and vinegar until simmering in a large high-sided frying pan. Break each egg into a cup and gently add to the water. Poach for 4 minutes, or until the yolk is nearly almost set. Carefully removed the eggs from the pan with a slotted spoon to drain the liquid and place on a towel lined plate. Season the top with salt and pepper. To serve, divide frisee among four plates, and top each salad with a poached egg. Scatter some more lardons on to each plate, drizzle with additional vinaigrette. Garnish with remaining toasted almonds.